If you need the perfect gift for a less technical member of your family, it's hard to beat a Chromebook. It's simple to use, covers most basic use cases, and is cheap. Today, Amazon has an Acer Chromebook on offer as one of its lightning deals. 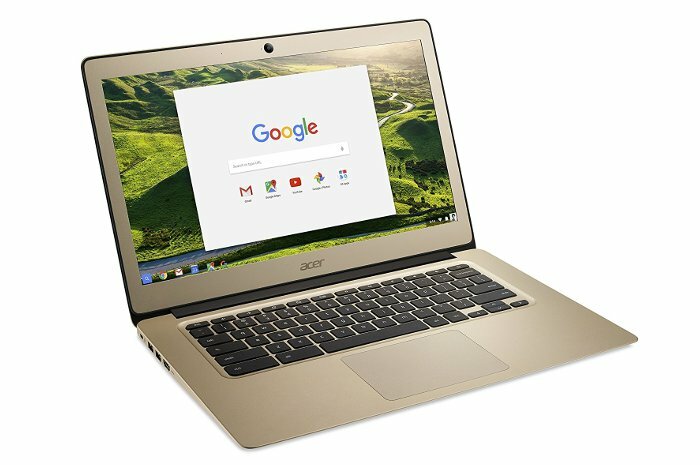 You can pick up a gold-colored Acer Chromebook 14 for $250. The deal lasts until 8PM Pacific time on Tuesday or when supplies run out. The Acer Chromebook 14 features a 14-inch 1920x1080 display, 4GB of RAM, 32GB onboard storage, and a 1.60GHz Intel Celeron processor--more than enough for most users on a Chromebook. It also has two USB 3.0 ports, one HDMI out, a 720p webcam, 802.11ac Wi-Fi, and Bluetooth 4.2. The chassis is 100 percent aluminum, and it's relatively light at 3.42 pounds. At its thickest point, the laptop is 0.67 of an inch. This device also has the added advantage of being Play Store Ready, meaning you can run Android apps on the laptop. If Chrome OS is not enough for you, there's the option of running Linux as well. For most people, however, Chrome OS is robust enough to handle typical tasks such as web browsing, email, YouTube, Netflix, word processing via Google Docs or Office Online, and basic image editing.